There are many people behind an individual’s success. No one goes it alone! 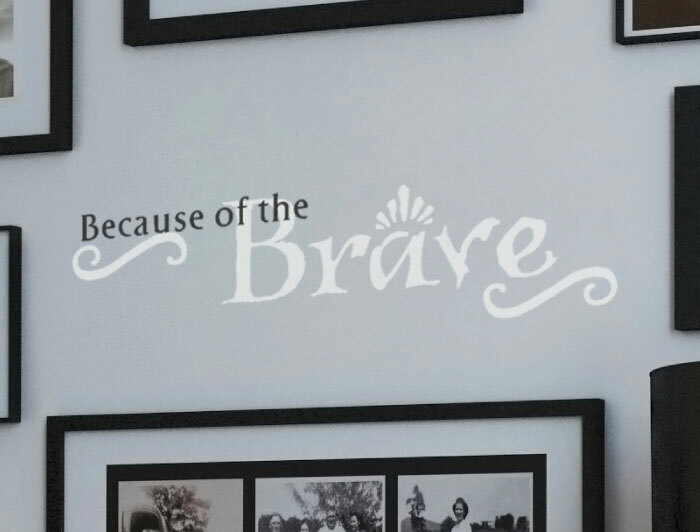 At WiseDecor, we have wall words that help you appreciate the important people in your life. 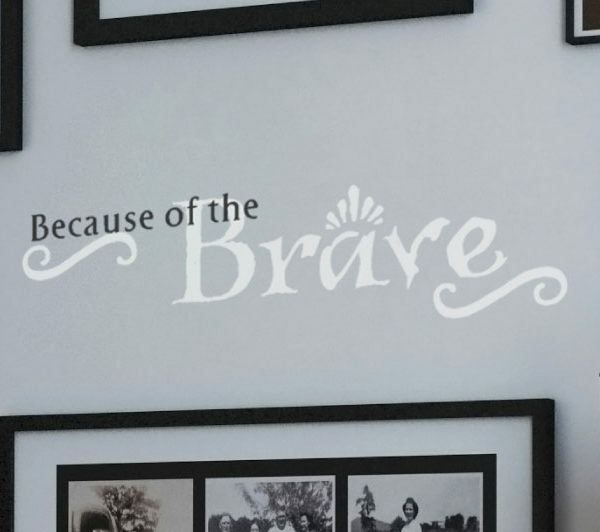 ‘Because of the brave’ wall letters are appropriate on this photo wall. They are in the midst of framed photos and they look great! They also tie in with the black and white color theme and are the focal point. The swirls and lettering art are upbeat and create a joyous mood! 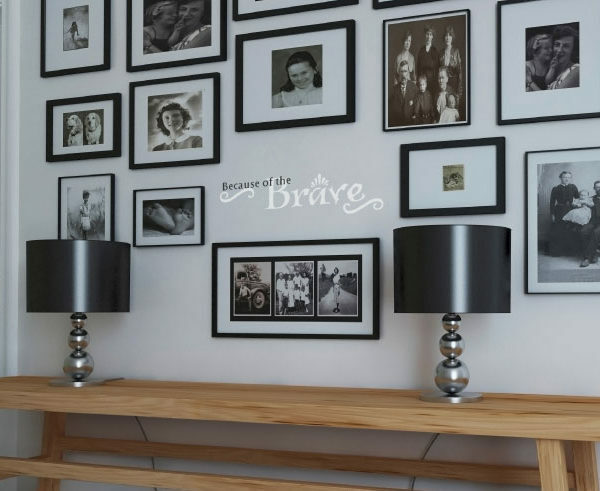 This is a creative way of honoring friends and family. How precious! Are you looking for wall decor gifts? Our products also make for unique gifts: birthday, baby shower, weddings and house warming! Place your order on our user-friendly website. Have our look at our various categories we have for more wall letters such as this one. You will be pleasantly surprised! 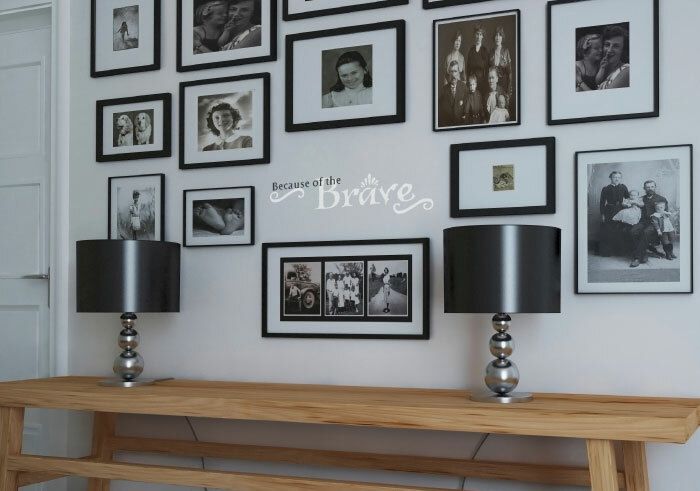 Select your preferred quote: make sure you use our previewer to make sure that you have selected the right color, size and style for your wall space. Submit: our experienced designers will take it from there! You will receive your money’s worth. Application is easy! Simply peel back the underlying back sheet and paste the adhesive side of the lettering on to the wall. It is that simple! Our wall letters are durable and affordable. Resin made, they are resistant to extreme temperatures. You will enjoy them for years to come! Do call or email. We would love to help you decorate with relationship building wall quotes!